What Happens If I Don't Clean My Filter? There are many reasons why you should replace your air filter. Many people leave the same filter in for months before they replace it. If your filter gets real dirty, the dirt and dust will start to get inside your system. The performance of your cooling system will begin struggle. Your evaporator coil will start to get clogged up with debris. It will usually take a few months of filter neglect before your coil start to get dirty. Once you have a dirty coil, you are going to have cooling problems. If the ambient warm air can't get through the coil, it will freeze. Once the coil freezes you will notice that there is no air coming out of your vents. In order for your system to start cooling again you will have to defrost your unit. You will have to fully defrost your system in order for it to work again. Your unit will start cooling again, until it freezes again. Besides the performance of your HVAC unit being affected. Your will start to have problems with your indoor air quality. The root of good indoor air quality starts at your filter. A clean filter helps protect your home from allergens and pollutants. Keeping the dirt in your filter and not in your unit will help keep your unit clean. When your home starts to smell bad its usually, because bacteria is growing in your evaporator coil. The only way to take that smell out, is to have your coil professionally cleaned. Operating your unit with a dirty filter for long periods of time can actually damage your unit. Key components like your compressor and capacitor have to work way harder to get to temperature. Usually customers that have capacitors replaced often is because they run there unit on dirty filters. Dirty filters can cause a domino effect of repairs in your unit. Some customers want to use a high quality filter after the unit is a little blocked up. Your unit might not be able to handle a high performance filter now, without a professional cleaning. There are a few low RPM air handlers that work very poor with high quality filters. If your coil gets real dirty, you are going to need a coil cleaning. There are two types of cleaning. Cleaning in place and removing the coil from the unit. You should only clean in place if removing the coil is not an option. You can then acid wash the coil by removing it out of the system. After removing the coil you can then use this as an opportunity to clean the primary drain pan in the evaporator box. You can save yourself lots of trouble if you just change your filter. You want to insure that the power and gas is off before you begin to tune up the furnace. Safety is always important during a heating check. Properly closing gas valves during an inspection will prevent the furnace from firing up by accident. You will need a small paint brush to clean the interior of the furnace. You are carefully going to brush the wires, components, and space around the combustion area. Make sure you are not moving or breaking any wires or connections in the area you brushing. You want to get all the dust out the furnace so you have a proper and clean combustion. You need to make sure that your air filter is the correct size. Incorrect filter size will cause dust to go inside your furnace. It is recommended to have a professional remove a clean your burners & blower wheel during heating system tune up. Removal of your blower motor or burners should only be done if your unit is over 3 years old. You can then perform a final performance test of your burners. You want to make sure the flames are steady, and that the flames are blue not yellow or orange.You also should have carbon monoxide testing. Making sure that you have no carbon monoxide leaking in your return or supply ducts in your home. When it comes to emergency AC repair, choose a service provider that is proven trustworthy. 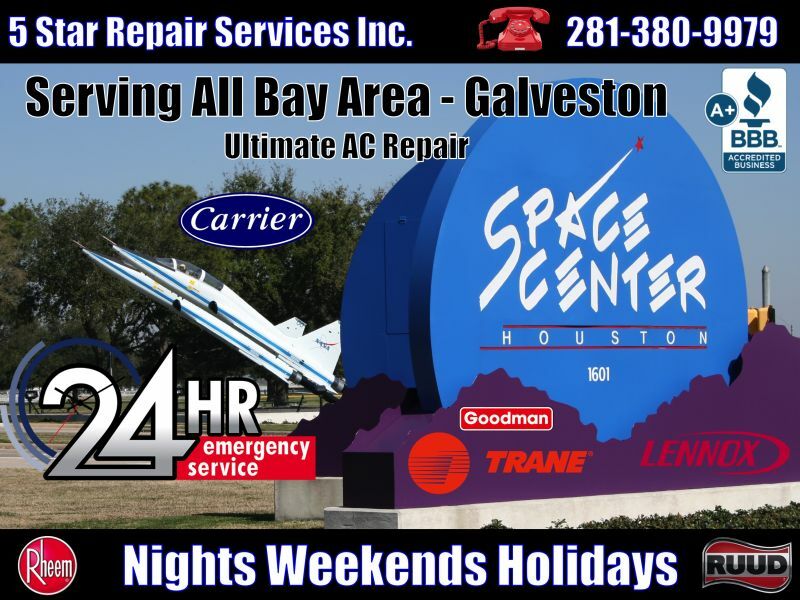 Call us for your 24 hour AC repair needs in and around Friendswood, Pearland, League City, Baytown, Galveston, plus other neighboring cities in Texas. 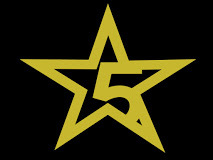 5 Star Repair Services Inc has the industry experience and credibility to get your AC related concerns addressed. We specialize in providing emergency AC repair for residential and commercial clients located in Friendswood 77546 77089, Pearland 7545 77511 77089 77047 77578 77581 77583 77584, League City 77574 77573, Baytown 77520 77521 77522 77523, Galveston 77550 77551 77553 77555, Alvin 77511 77512 77583, and other nearby locations in Texas. Our rates are affordable, and our team is experienced and always available. Give us a call, and we can even give you some valuable troubleshooting tips, absolutely free. Our commitment to service excellence can be felt the moment you contact us. We are available at any hour of any day. We are ready to assist you with your emergency AC repair requests, 24 hours a day, nights, weekends, and even holidays. You will be dealing with knowledgeable and friendly AC specialists. Be assured in knowing that you're assisted by technicians who are experts at what they do! Your peace of mind is our business. Contact us for your 24 hour assistance and emergency AC repair needs in Friendswood, Pearland, League City, Baytown, Galveston, Alvin and other surrounding parts of Texas. AC repair may be an unexpected cost, but you can turn it into an investment by choosing the right service HVAC company. The services we offer are straightforward, affordable, and most importantly hassle-free. Enjoy the convenience and peace of mind knowing that you are dealing with experienced professionals. Contact us, and you can immediately tell the difference, even our previous clients in and around Texas agree – Friendswood, Pearland, League City, Baytown, Galveston, Alvin. Whether you choose to call or reach out online, we will be right with you! 5 out of 5 stars. 188 votes.